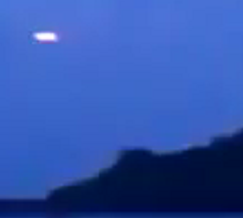 Latest UFO sightings – Bright object was recorded hovering above Kauai island in Hawaii. This was taken in May 2011. The object is there, it&#39;s not fake but we don&#39;t know what it is, could be landing airplane, It&#39;s hard to tell, no movement at all. FLYING BANTY HENS,NOT&quot;4 rooster&#39;.Glowing UFO over Kauai,?,with?&quot;UFO FLEET CLEARLY FILMED CIRCLING Hawaii 411&quot; on the y tube may 2011. Why stop filming as this object gets closer? Could it be because it&#39;s obviously an airplane? Could someone translate Mary&#39;s comment for me? your looking at the end of the runway. that plane is heading out to sea!! !